Yesterday was our last full day in Canberra & what a stop it has been. A really productive trip that was heaps of fun. 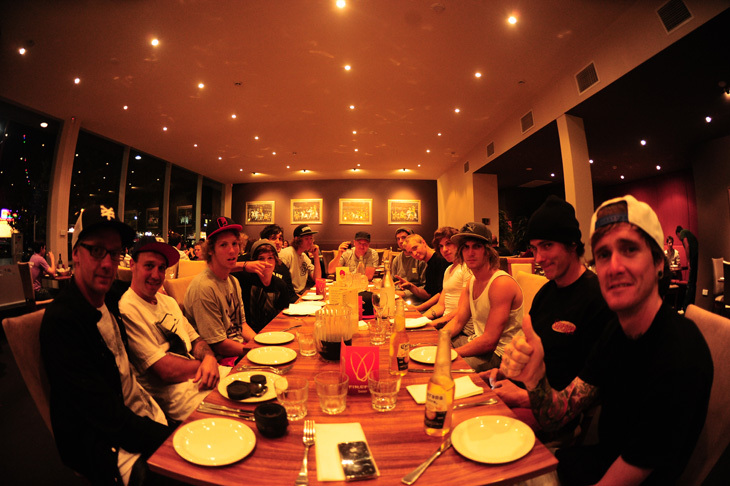 Thanks to all the boys for their effort this trip, stoked. Bloody amazing times. Yesterday was another good day here in Canberra despite the heat. Plenty of riding was done & fun was also had off the bikes as well. Photo below of Baby Bergs below getting his no handed horsey ride on. We’ve been in Canberra for a few days now & we have had some really good filming days so far. Yesterday was no exception & was probably one of the best days on the trip. We all went to dinner last night as a celebration & had some great food. Always good times. Thanks to all the boys for putting in the hard work on this trip. You guys all rule. Yesterday we had the Backbone BMX in-store & the last our our trip. Rhysty & Tyson as always were great hosts & there were a bunch of kids hanging out. We soon had the bunny hop comp going well underway & the pair forks were won with a hop of 34 inches. Jack O’Reilly who works at Backbone did the trip record with a 40 inch hop. Thanks to all those that came out & hung out. It was a good afternoon. 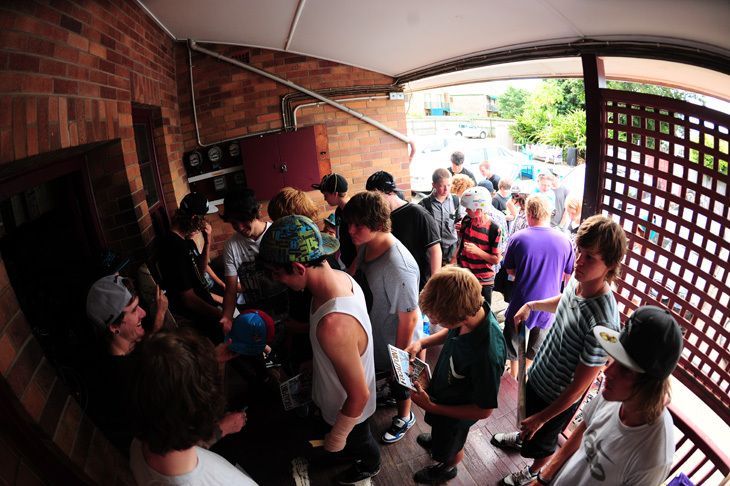 On Wednesday we had the in-store at Above All BMX in Engadine. 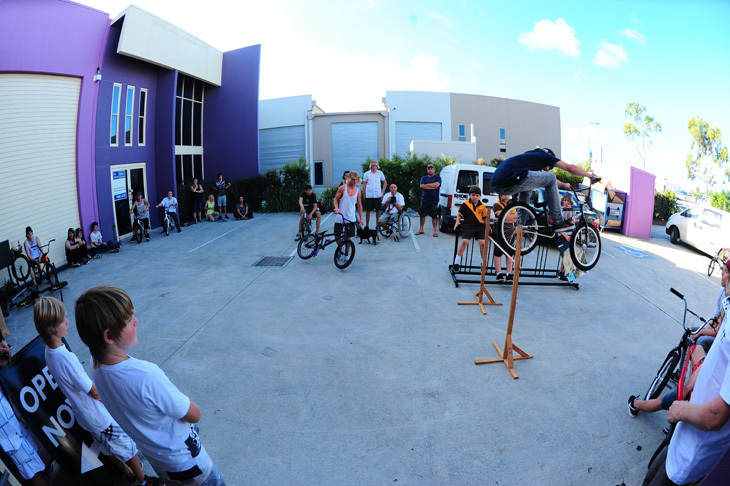 It started out well with a good turnout & we started the bunny hop comp. Then the police we’re called by someone nearby saying there was a menacing crowd of BMXer’s causing trouble. So far from the truth. Either way were were told we had to shut it down. We all retreated to behind the shop & made the most of it with a mass games of dice for the prizes. The BBQ started up & all was good. Thanks to Laura from Above All & thanks to big Eric for taking the heat from the police. A big thanks to all those that came out & hung out, good times. Yesterday was an amazing day. We got up early & starting clocking clips from the get go. It was a really productive day & although the weather looked bad in the morning it cleared up perfect for the afternoon. 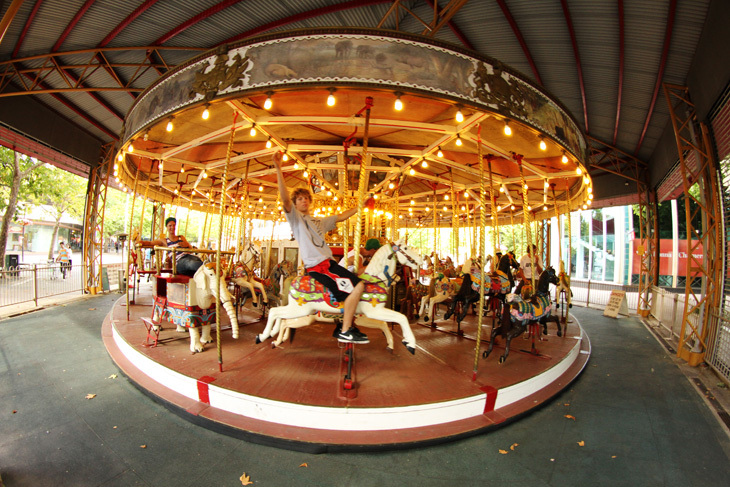 We rode various spots from 10am till 1am at night. Some bangers got done by all. We are off to Canberra now so gotta run but see you all at the Backbone BMX in-store at 3pm today. 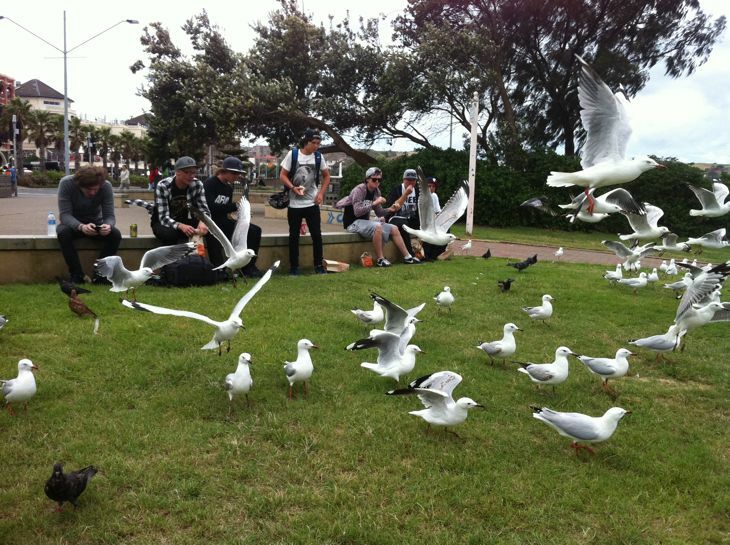 Photo from a few days ago having breakfast down at Bondi Beach with a few mates. 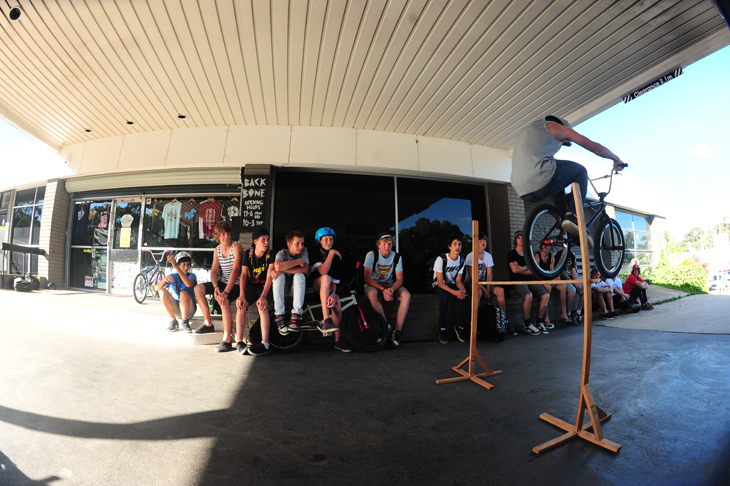 Make sure you come along for our in-store at Backbone BMX today between 3 & 5pm for your chance to score some giveaways. We will also have a bunny hop comp for all to win with a pair of forks up for grabs for the winner. So come along & meet the team this arvo with the guys from Backbone. Our in-store at Above All BMX is on today from 3-5pm. Come along meet the team, enter the bunny hop comp for a chance to win a pair of forks & you may also be lucky enough to score some giveaways. See you there !! Yesterday we had a bit of a mixed day here in Sydney due to the rain that kept following us. Regardless some stuff got done that was pretty good to see. Today is looking to be a good day with better weather predicted. Should be good times for sure. After a mammoth drive yesterday we made it to Sydney at around 1am last night. Such a mission but we’re all looking forward to the next few days ahead. More reports soon. We had our in-store at Ventoux Cycles yesterday & it was an amazing time. Thanks to Al & everyone for their hospitality, it was greatly appreciated. Even though it rained we still had a great time. 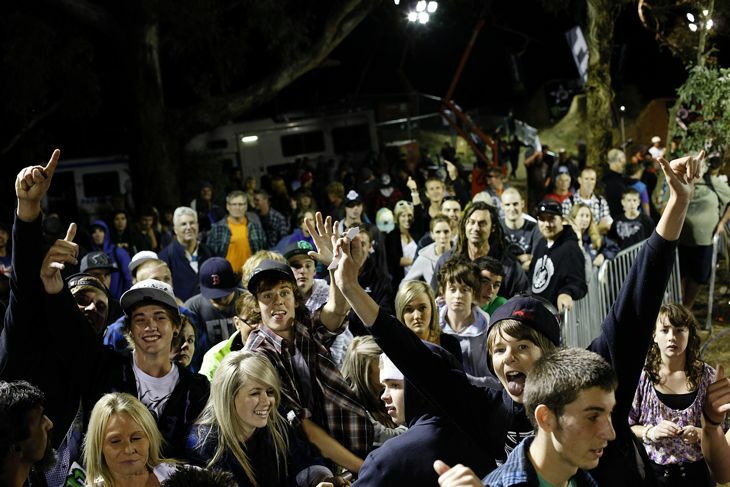 The bunny hop comp went really well considering it was raining & the locals did really well. Rahdi Frances (David Cater) won from the locals with a 37 inch hop in the rain & scored himself a pair of forks, well done. Thanks to all those that came out & said g’day. Once again thanks to Al & everyone at Ventoux, good times !! 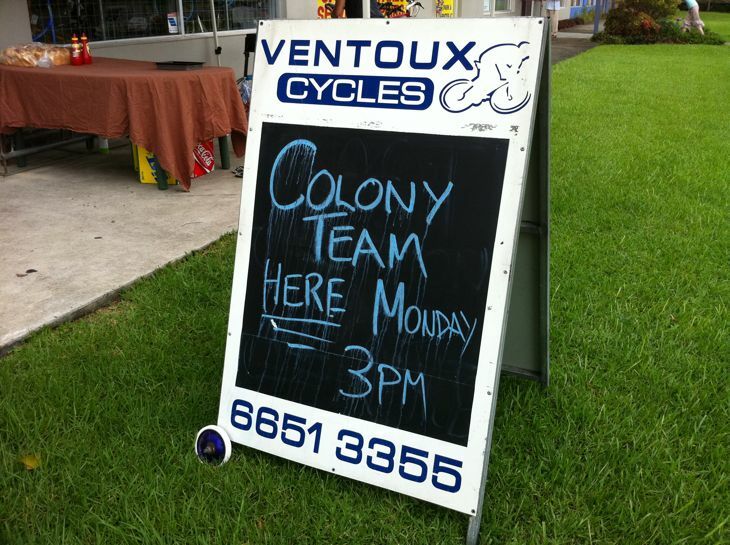 Make sure you come out to Ventoux Cycles in Coffs Harbour from 3pm till 5pm today for our in-store appearance. We will have a bunny hop comp for all to enter & some giveaways as well. Come along & meet the team, see you there !! 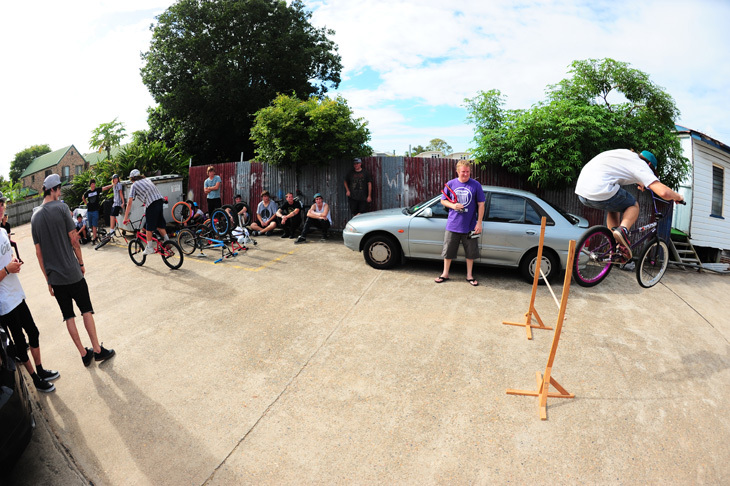 Yesterday the nation wide BMX for Floods jams went down to raise funds for the flood appeal. The Beenleigh leg went down really well even with the 37 plus degree heat we had to endure. Not sure exactly on the amount raised but I believe it was well over $2,000 so far. Thanks too all that came out & made it a huge success. Guettler got everyone to make a bike pile after the day finished & here is the result. Paddy Gross & Alex Hiam. 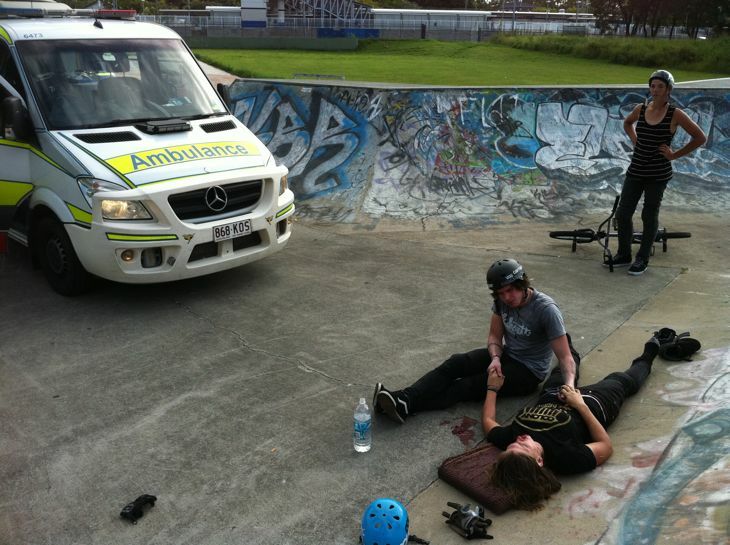 Yesterday Peta Shepherd had a bad crash on a tailwhip nosepick gone wrong. She took it hard & ended up having to go to hospital. She will need some facial surgery & dental work in the weeks ahead. It was one of the scariest crashes I have seen. Paddy & I visited her today & she is in great spirits talking about riding again already. Such a trooper !! Rest up Peta & please take it easy. Check back here in the weeks ahead as we will release a special limited edition tee shirt with 100% proceeds going towards her medical bills. 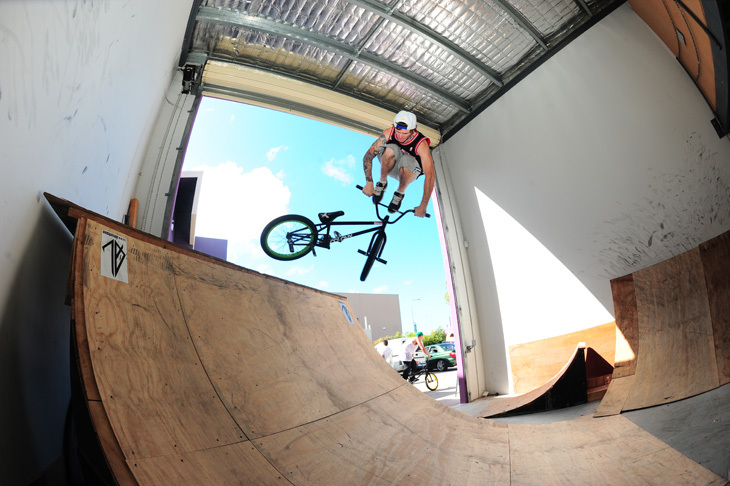 We had a great time hanging out and riding the ramps at Helensvale BMX. 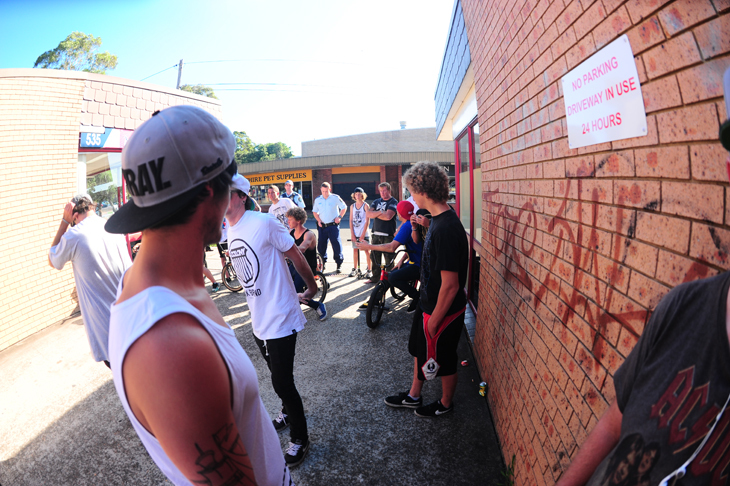 Thanks to everyone who came out and the guys at Vale, much appreciated! Below we have Tom Stretton with an alleyoop downside whip and also a local shredder, Keahnu Doyle, who won the bunnyhop comp with a hop of 37 inches. He scored himself a pair of forks for his efforts. Spokes NT in Darwin, NT are a huge Colony supporter & have been for many years now. They recently built up this Sweet Tooth custom below for a customer. Looking the goods no doubt. 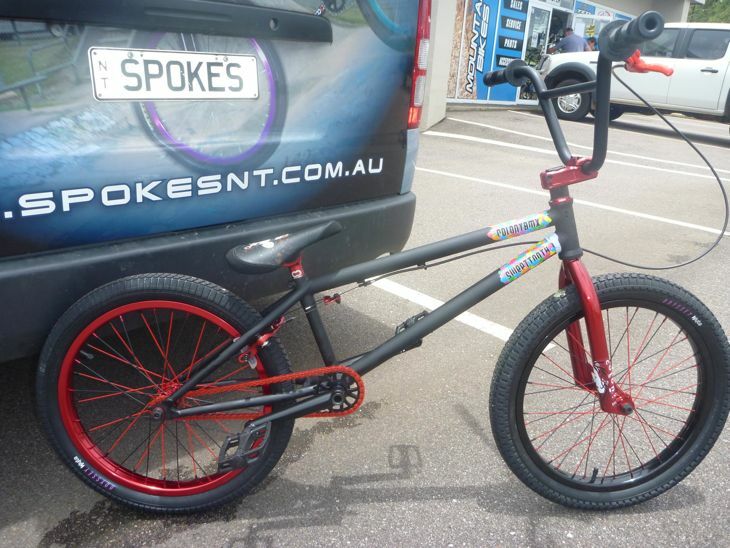 Spokes NT are also supporting the Darwin leg of the BMX for Floods Jams happening tomorrow around the country so you know they are in BMX for the right reasons. Yo, The temperature was around 10-17C° in Hungary, it was awesome to ride. This warm is unusual in winter here. There are some older clips in the video, sorry but I couldn’t ride street – Attila. 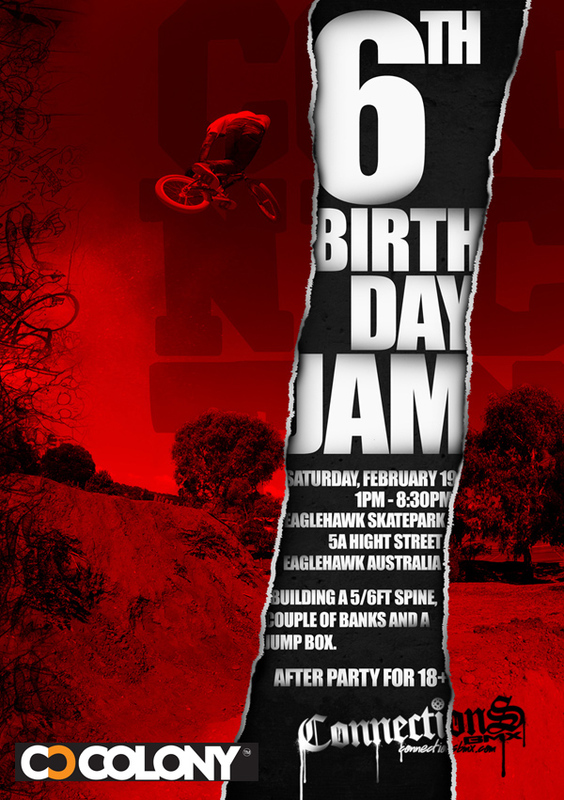 If you’re in the area make sure you get yourself along for Connections BMX 6th birthday celebrations jam tomorrow. Yesterday we had the Crossley Cycles in-store & it was a blast. There was a great turnout & Richard put on a bunch of pizzas for everyone. 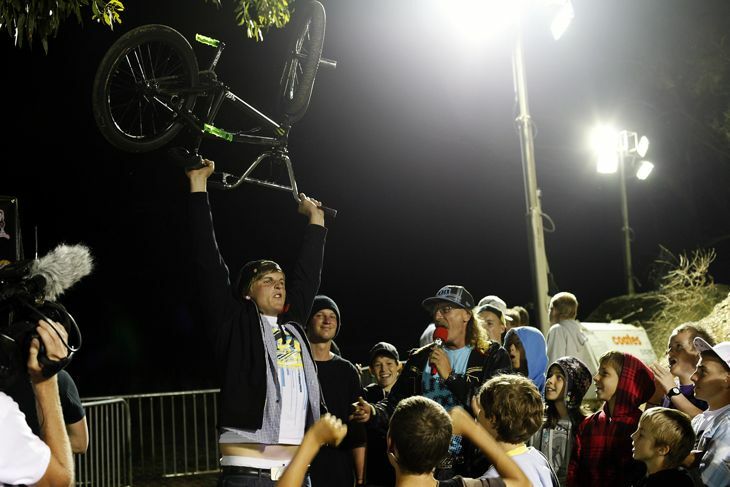 Matt Sheriff won the bunny hop comp between the locals with a hop of 32.5″ & scored himself some forks for doing so. Thanks to all those that came along & hung out, it’s appreciated. Word. We have a new tee out, called Since. It’s a basic logo tee printed on the usual slightly longer but not wider blanks that we use. I think it came up pretty good! We will have these with us all along the trip the next couple of weeks. Hit us up at the various in-stores for your chance to buy one while they last. 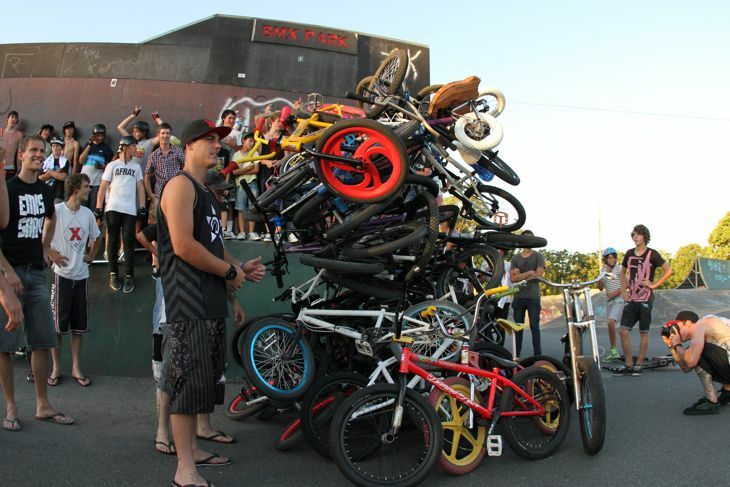 If you’re down on the Gold Coast make sure you drop in at 3pm today at Vale BMX. 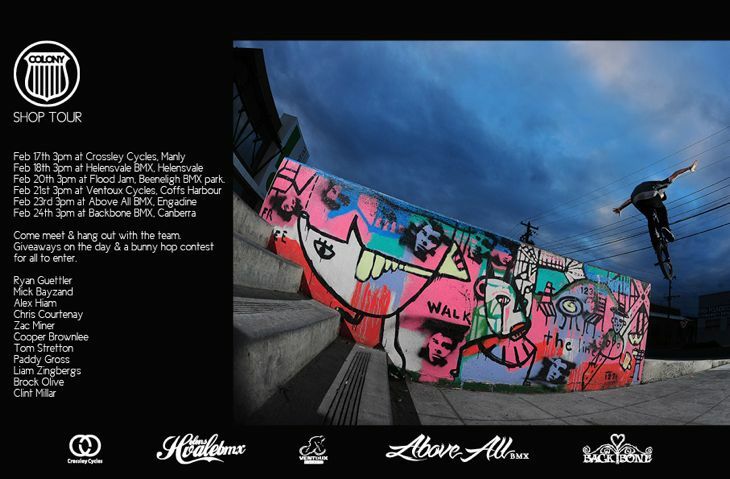 We will be there to hang out, have a bunny hop comp, throw out some freebies and do some riding too. See ya there! 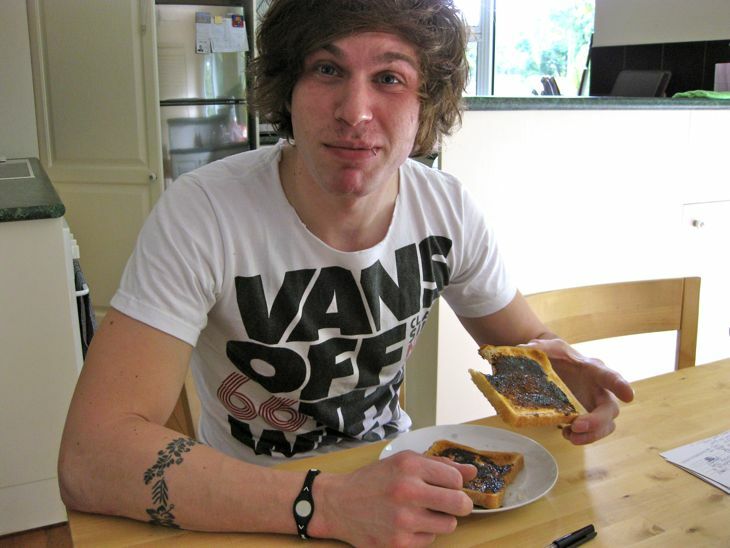 Paddy Gross arrived into Brisbane from Germany a few days ago now & is here for our trip down south next week. Should be good times. He is here for 2 weeks & will be packing in as much riding & travelling as possible in such a short time. 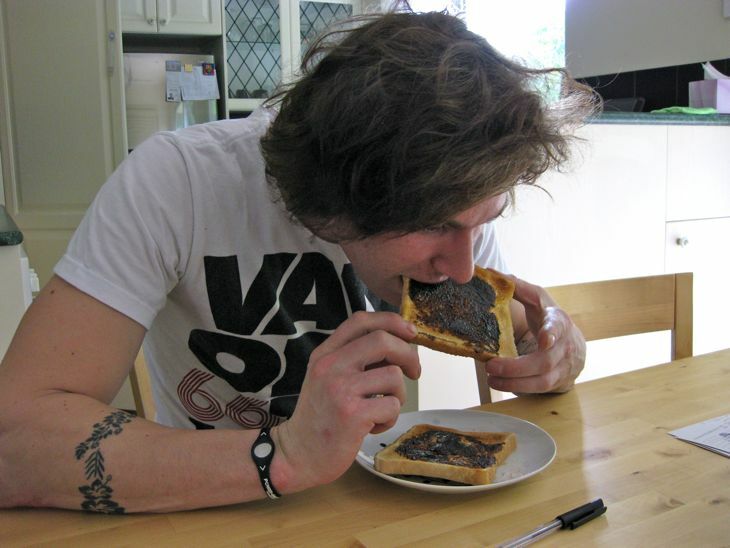 Paddy had his first Vegemite on toast experience this morning. His first words were, ‘It tastes like grease!’ Welcome to Australia mate !! 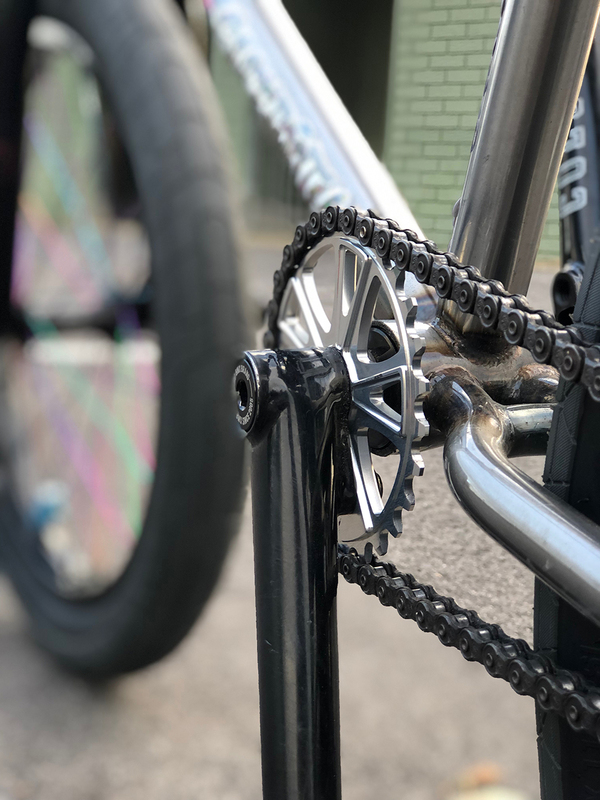 Over on TheComeUp I have an interview with myself about Colony, my own riding, the Australian riding scene & BMX industry. Click here to check it out now. Don’t forget we have the in-store at Crossley Cycles today at 3pm. Come along, hang out, meet the team & join in on the bunny hop comp. See you there !! Alex Hiam is finally back on his bike after a long 6 months off due to injury. Saw him ride today & it looked like he maybe stopped riding for no more than 6 minutes more like it. Still got all his tech stuff which was so good to see. He also is riding his new bike set up which of course is always based around his signature frame, the Sweet Tooth. It is the only frame engineered exclusively for smaller riders like Alex out there. Check it out at a Colony dealer near you now. All the boys got into town last night & we’re all itching to go ride but the rain is a real pain. Hanging in the office this morning doing bike maintenance & talking smack. Hopefully it clears up soon. Don’t forget the Crossley Cycles in store tomorrow at 3pm. See you all there. Paddy, Liam Z, Zac, Cooper, Mick & Tom. I received a phone call from Ryan the other night asking if it was cool he gave his bike away at Cams Jam. I said sure if you think it’s a good thing… read on below. 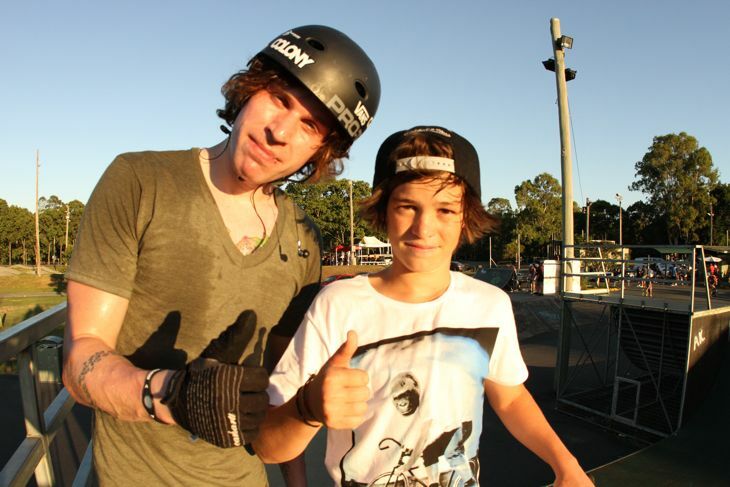 What a rad weekend, I had the chance to go to Cam White’s Jam and had a blast. The riding was amazing Jed Mildon did a double flip on the massive jump and James Foster did a whip to double whip back. Crazy. Everything was towards charity from rider entry fee to buying food for the night. I wanted to do my part so I jumped on the mic and said if I see a kid screaming all night for the riders or just somthing really crazy I’d give that person my bike. What I saw was pretty funny it had the crowd going wild, as best trick was going on, a guy ran from the roll in all the way to the last jump NAKED. I thought it was pretty cool so at the awards I called him out and gave him my bike. So a big thank you to Colony for giving me the chance to do that. Your’e the man Clint. If you get a chance to get to Cam White’s Jam next year, do it one of the best times ever… Ryan. We just got to Brisbane, it was a long drive! We had rain most the time but we did get a chance to hit up a couple of spots which was fun, just like this Swansea park in NSW that was just finished and super super fun!